How often do you remember to say the Rosary? It enables us to focus on the Saints and remember the Trinity. Each bead represents a prayer and a path to take. It is God’s love and obedience we must not forsake. 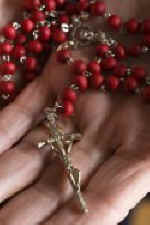 Say the rosary every night for World peace. The Planet belongs to God; we only hold the lease. We have vandalised his property without a care. We don’t really play fair. Yet God gave us everything including his Son. He gave us the Title deed when creation was done. As selfish human beings we spurned his Kingdom of Love. We said that this simply was not enough. Please say the Rosary, pray for the world and for one another. Treat everyone as your sister and brother. With each bead focus on God and hold that thought. The true love of God can never be bought.